Crunchy, sticky toffee apples are the perfect treat on a chilly autumn or winter's day, which is what makes them so perfect for enjoying during apple picking season, Scotland's traditional Bonfire Night, or on Halloween. They are so easy to make, though, so don't reserve them just for those autumn celebrations—they are delicious any time of year. 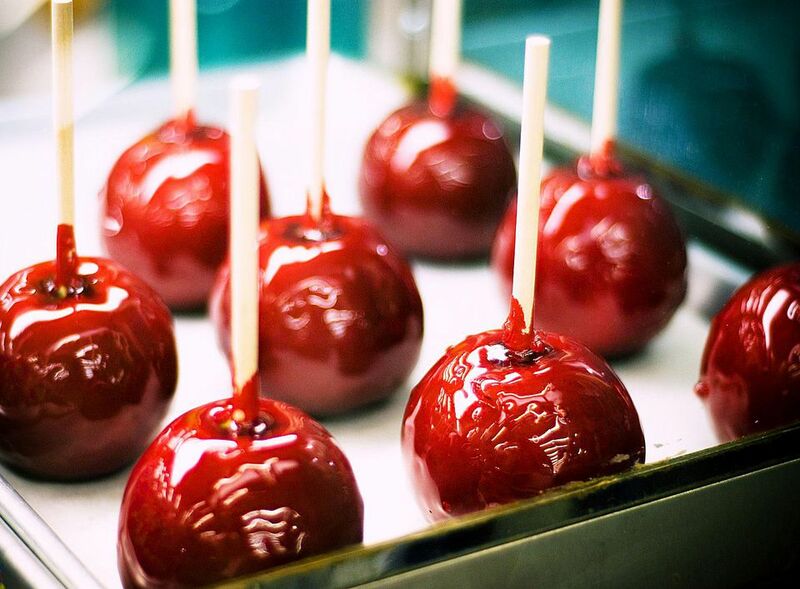 Making your own toffee apples beats store-bought by a mile; once you try them you'll see. Although toffee apples are best eaten as soon as possible, they will store well wrapped in cellophane or in greaseproof (parchment) paper. Place the sugar, warm water, glucose, and vinegar in a large saucepan. Gently heat, while stirring, to dissolve the sugar, but make sure not to bring to a boil at this stage. Once all the sugar has dissolved, raise the heat and bring the toffee to a rolling boil. Using a candy thermometer, boil to 270 F/140 C. This can take 10 to 20 minutes. If you do not have a candy thermometer, take a cup of cold water and once the toffee has started to thicken, drop a little of the toffee into the cold water. The toffee should solidify as it hits the water, and when you remove it from the water, the toffee threads should still be slightly flexible, not brittle. If the toffee is soft, continue to cook. While the toffee is boiling, place the apples in a large bowl and cover with boiling water. Leave for a few minutes, then remove from the water and rub the apples with a tea towel and dry thoroughly. (The hot water and the rubbing will remove any waxy surface from the apple.) Once dried, remove the apple stems and push a chopstick or lollipop stick into the hole. Once the toffee is ready, remove from the heat and leave to stand for 5 minutes to let the bubbles subside. (It is important to wait until all the bubbling calms down to create a smooth surface on the apples.) Once the bubbles have stopped, add the food coloring and stir gently. Working quickly, tilt the pan slightly and dip the apples into the toffee; twirl around to completely coat the apple. Lift the apple from the pan and allow any excess toffee to drain away. Stand the toffee apple onto the lined baking sheet and leave to set around 20 minutes, or longer if possible. If the toffee starts to thicken and harden as you are coating the apples, place the pot back on the heat and warm through, but do not boil. If you are not eating the toffee apples right away, wrap in cellophane. This recipe calls for golden caster sugar and liquid glucose. Golden caster sugar is another term for finely ground granulated sugar and is prized for its ability to dissolve quickly. (You can easily make your own in the food processor.) Liquid glucose, also called glucose syrup, is a thick, clear syrup used in confections and jam recipes. There are two tricks to making sure the toffee coating sticks to the apples. First, is making sure the apples are nice and dry and free of any wax coating. The second is that the toffee is at the right temperature and consistency; it should not be too loose that it slides off of the apple, but not too hard that it won't coat the apple properly.